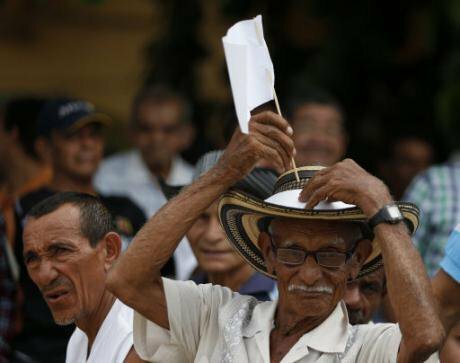 An elderly man places a white flag on his hat during a concert for peace in Carmen de Bolivar, Colombia, Sunday, Sept. 25, 2016. AP Photo/Fernando Vergara. All rights reserved. Colombia’s armed conflict, the longest-running in recent global history, left more than 220,000 people dead and about 6.7 million displaced within the region. A cease-fire agreed on 29 August 2016 had already formalized the end of combat activities between state forces and the FARC, formally known as the Revolutionary Armed Forces of Colombia — and all hostilities against civilians. After decades of brutal violence and several failed peace processes, this was reason enough to celebrate. The formal signing of the peace deal today in presence of 2,500 invited guests from Colombia and abroad, including 15 state leaders and representatives of international organisations, suggests that this time that the two main sides are serious about peace. Who are the players in Colombia’s security landscape? The FARC — Last week, the FARC held their 10th Conference during which their leadership approved the accord, paving the way to dissolve themselves as an armed group and become a political movement. Even though FARC rebels have already moved to “pre-concentrate” themselves, the official demobilization process, which will last for 180 days, is yet to start. Certainly, “Day D”, the day the process kicks off, will only be after Sunday’s plebiscite. However, it might also take longer: one controversial issue that has been discussed at the FARC’s conference was the Amnesty Law that still needs to be approved by Congress. This decision may only be taken in the next few weeks and may delay “Day D” even further. Moreover, members of the FARC’s Front 1 are still reluctant to demobilize, and others may follow the dissident group. Other violent non-state groups — The FARC is the largest non-state armed group in Colombia — but not the only one. One danger is that the FARC’s demobilization will have a “balloon effect” on the operational sites of other groups, including the ELN, Colombia’s second-largest rebel group, and numerous right-wing and criminal groups. If the state does not establish its presence quickly, these groups may move to the regions the FARC leave behind and fill the power vacuum. These groups may also recruit demobilized FARC combatants or forge alliances with newly emerging groups in areas they already control. The world will be watching the 22 normalization zones and six camps spread across the country — the territories where the FARC is supposed to demobilize and lay down weapons. Meanwhile, the other regions will receive less attention, even though armed actors will continue to operate there. As discussed in the Monkey Cage, the state historically had abandoned many of these areas — which evolved into strategic zones for transnational organized crime, especially the illegal drug trade. The world will be watching the 22 normalization zones and six camps spread across the country — the territories where the FARC is supposed to demobilize and lay down weapons. The desert-like north at the Colombia-Venezuela border, for example, constitutes a no man’s land to most Colombians and foreigners. However, this state neglect turned illicit activities into a legitimate income source and attracted many entrepreneurs of violence. In southern Colombia, armed groups exert strong social control over large areas, impeding any information, including on human rights violations, from leaving the region. Here, the war has confined, rather than displaced, citizens. FARC ex-combatants and other groups can easily move to such territories to “govern” them and engage in illicit business deals. The armed forces — The Colombian armed forces will have to protect FARC ex-combatants in the normalization zones and camps, while continuing military operations against the ELN and other violent non-state groups. The normalization zones will cease to exist after 180 days, and the lines between ex-FARC members and other groups are likely to become increasingly blurred. After decades fighting the “enemy,” the armed forces may be reluctant to let ex-combatants go off and live their own lives. FARC guerrillas have been collaborating with other armed groups, which are still targets of military operations. The armed forces also have a crucial role in providing marginalized areas with infrastructure and basic services, but if this is to enhance truly sustainable development, these interventions need to go along with strengthening civilian capacities. Past efforts such as Colombia’s Consolidation Plan in 2007, which aimed to recover territory previously held by rebels, had a minimal effect: Many regions saw military interventions, but no follow-up development of civilian institutions. The United Nations — While the normalization zones are running, a U.N. Security Council-mandated mission will monitor and verify the demobilization of the FARC, including the laying down of its weapons. Then a three-year U.N. mission under the mandate of the General Assembly will continue to verify and monitor that ex-combatants comply with their responsibilities and receive due protection. The U.N. mission will need to coordinate closely with other U.N. agencies and nongovernmental organizations, which will be working on the reintegration process and the protection of civilians. But civilians may feel that measures to ensure the physical security of former FARC fighters and provide them financial benefits favor the ex-guerrillas over noncombatants. Thus, balancing these efforts is key to avoiding new grievances. The U.N. mission will need to coordinate closely with other U.N. agencies and nongovernmental organizations, which will be working on the reintegration process and the protection of civilians. Regional players — Sustainable peace and security will also depend on other players in the region. Violent non-state groups, including Mexican cartels, have started to fill power voids across Colombia’s borders. While the armed forces are constrained by principles of territorial sovereignty, and the United Nations has to adhere to national mandates, the activities of these groups extend beyond borders. Although not conflict actors per se, their actions can easily destabilize the region, increasing the risk of a relapse into civil war. Colombia, therefore, needs to promote a regional security architecture, through bilateral military and police cooperation and regional organizations respected by both Colombia and its neighbors. Marginalized communities — Colombia’s marginalized communities also have an important role in the peace process. Once the normalization zones phase out, these communities will be particularly vulnerable to acts of retaliation and abuse by any violent group that may attempt to occupy those spaces. Given that the Colombian state lacks legitimacy in the eyes of many of such community members, this vulnerability is particularly concerning for sustainable peace. Local voices from places such as Putumayo, Arauca, Catatumbo and La Guajira, some of the country’s most neglected regions, all remain skeptical that the government will be able to meet its promises. Their skepticism toward the state’s suggested support is understandable. I witnessed the lack of roads, electricity and basic services in these regions. Furthermore, in Norte de Santander, misinformation campaigns — possibly the work of corrupt local elites and various violent non-state groups — make people believe that the country will be handed over to the FARC. In such places, intimidating text messages, threatening pamphlets and ominous posts on social media have already been effective at influencing public discourse and silencing defiant voices — long before the polarizing plebiscite campaign started. These strategies will gather more steam if the Colombian government cannot communicate clearly what benefits the peace deal will bring to those communities. The government must show that it will deliver on its promises to mitigate people’s fear of an uncertain future. In the very short term, if Colombia’s people on the peripheries have greater trust in the Colombian state, that would help pave the way to a “Yes” in the October plebiscite, which would set the course for the six-month demobilization period. This would deprive newly emerging violent groups of social support, while empowering democratic processes. It is also key to reducing new grievances, similar to those that were at the root of the civil war in the first place and thus would help to prevent Colombia’s violent history from repeating itself. For this peace agreement to have a long-lasting impact, the challenges that all these players face need to be addressed and the two parties must continue to walk the talk on Day 180+1: The government must meet its promises and the FARC must fully step away from armed activities and hostilities against civilians. This slightly revised post originally appeared in The Monkey Cage at The Washington Post on 8 September, 2016. If you liked this article follow us on Facebook and Twitter.